BURLINGTON, N.C. (Sept. 26, 2018) -- Paul Simson of Raleigh has another CGA trophy to “add to his arsenal,” as he put it, after capturing the title at the 11th North Carolina Super Senior Championship hosted at Alamance Country Club in Burlington. Simson is not only a Carolinas Golf Hall of Fame member, but he also holds the record for all-time CGA championships. “Is this 34 or 35 championships?” Simson asked. It’s 35 and he’s not likely to stop there. Simson has a lot to pleased with from his final round. Simson’s 2-under 69 consisted of 18 greens in regulation which led to three birdies and only one bogey. He began the day with a one-shot cushion but found himself two down after seven holes to his competitor and friend, Don Detweilerof Raleigh. A birdie on the 12th hole put Simson within one shot of Detweiler. Simson made a 25-foot putt for birdie on the 13th hole to get back to even. Detweiler bogeyed the two par threes on the back nine to give Simson the lead. A birdie on the par-5 17th got Detweiler back within one but a par on the 18th hole would result in a second place finish. Ray Womack of Burlington started the day just one shot off the lead. He got his final round off to a solid start with three birdies in his first six holes. He was able to make two more birdies on the back nine but came up one shot short to finish tied for second place at 5-under total for championship. Simson has some history at Alamance Country Club. In 1991, he won the North Carolina Amateur there against radio-show host, John Maginnes. That year he’d go on to win the Carolinas Amateur and the Carolinas Mid-Amateur. Detweiler and Simson will team up at the 7th Super Senior Four-Ball hosted at the Country Club of South Carolina on October 8-9. Two-time CGA Champion, John Walters of Charlotte, N.C., came from behind today firing a 3-under 68 to win the 70+ Division of the N.C. Super Senior Championship. Walters’ first round was similar to Simson’s second round in the fact that he hit 16 greens, made 17 pars and only had one bogey. The bogey was the result of a three putt on the par-3 14th hole. Walters’ second round seemed to start off similarly to his first. He began the round two shots back from the day one leaders and started off with seven straight pars. “That’s when the flood gates opened up,” Walters said. Walters made five birdies in his next seven holes and would eventually win by one shot over Alan Dirk of Pittsboro and Terry Rathman of Gastonia. 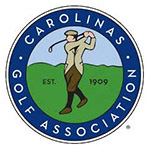 Open to any male golfer 65 and older, a resident of North Carolina, a member of a CGA member club, and an index that does not exceed 15.4.